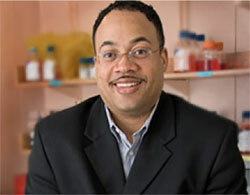 Dr. Milton Brown is a medicinal chemist who specializes in the design, synthesis and evaluation of new drugs. Dr. Brown is recognized as one of the top translational drug discovery scientists in the US today. Dr. Brown obtained his PhD in synthetic chemistry from the University of Alabama at Birmingham under Dr. Wayne Broyillette in 1995. He went on to obtain a medicinal degree at the University of Virginia in 1999 before securing a postdoctoral position in the chemistry department at the University of Virginia. In 2006 Dr. Brown moved to the Lombardi Comprehensive Cancer Center at Georgetown University where he serves as a principle investigator and director of the Drug Discovery Program. In 2008, Georgetown University appointed Dr. Brown as the Edwin H. Richard and Elisabeth Richard von Matsch endowed chair in experimental therapeutics, in recognition of his numerous scientific achievements. Brown has given more than 50 invited lectures in the US and Europe on drug discovery and development. Dr. Jeffries-El obtained her PhD in synthetic chemistry from the George Washington University in 2002, and completed her postdoctoral studies in 2005 at Carnegie Mellon University under Dr. R.D. McCullough. In 2005 Dr. Jeffries-El became an assistant professor at Iowa State University, starting a research program in the area of polymer science. In a short time period, Dr. Jeffries-El has published 25 articles in peer-reviewed journals. 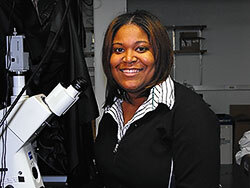 Dr. Jeffries-El has also received several research awards including an NSF Career award, Lloyd N. Ferguson Young Scientist Award (NOBCChE), 3M Untenured Faculty Grant, Gordon Research Conference-Carl Storm Underrepresented Minority Fellowship, and an Emerald Honors Most Promising Young Scientist Award among various others. Dr. Victor R. McCrary is the Vice President for Research and Economic Development at Morgan State University, Baltimore, MD. In his position, Dr. McCrary is "the agent of change" for developing a comprehensive research strategy for the University which includes: fostering cross disciplinary research, expanding the current base of research programs via external partnerships, increasing the University's intellectual property portfolio, and positioning Morgan State University as a catalyst for economic growth and vitality for Baltimore and the State of Maryland. He is the former Business Area Executive for Science and Technology at The Johns Hopkins University Applied Physics Laboratory where he was responsible for the management and business planning for science & technology internal strategic investments for long-term research & development. 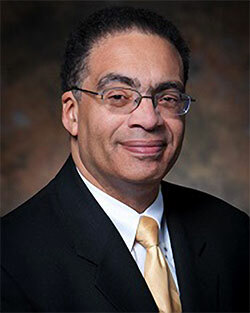 Prior to joining APL, Dr. McCrary was the Chief of the Convergent Information Systems Division at the National Institute of Standards & Technology (NIST) where he led programs in biometrics, digital preservation, DVD reliability and standards, Digital TV Standards and quantum communications. From 1985 to 1995, Dr. McCrary was a member of the Technical Staff at AT&T Bell Labs in Murray Hill, New Jersey, where he conducted research efforts in crystal growth for semiconductor lasers used in undersea telecommunication cables. Through his career, Dr. McCrary has been awarded The Department of Commerce’s “Gold Medal.” Science Spectrum Magazine gave him their 2004 Emerald Honors for “Career Achievement in Academia”. He received the 2002 Percy Julian Award for Lifetime Achievement in Science and Engineering. Kathy Goodson won the 2009 E. I. DuPont Graduate Fellowship Award from the NOBCChE. The E. I. DuPont award carried with it a $10,000 cash prize and the oppportunity to present at the National NOBCChE Conference was held in St. Louis, MO April 12-17, 2009. 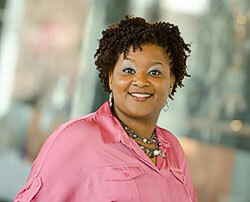 Kathy received a Bachelors of Science in Chemistry from Virginia State University in 2005. She earned a PhD in Biochemistry working under Jason Kahn, PhD. Kathy’s research involved “Single Molecule Studies of LacI/DNA complexes” in collaboration with Douglas English, PhD at Wichita State University. Kathy served as the president of UMD’s student chapter of NOBCChE from 2007-2008. As president of the student chapter, Kathy established NOBCChE’s partnership with the universities MRSEC organization. Also, Kathy was awarded the 2009 CMNS Board of Visitors Fellowship. Yomi Okunola is a 2009 Organic chemistry graduate of the University of Maryland, completing her work in the lab of Dr. Jeffery Davis. She is a person with an interesting story and an example to emulate. Born and raised in Nigeria, Yomi always strove for excellence but did not immediately know she would become a chemist. She began her studies in Nigeria with interest to become a physician or pharmacist, though there was a glimmer of interest in chemistry from high school. While pursuing her bachelors degree Yomi grew to love chemistry and with hard work she became very good at it and decided to go on the path to obtain her Ph.D. in chemistry. In 2002, Yomi moved to the United States and began her graduate studies at Howard University in Washington, D.C. After earning her Masters degree from Howard, Yomi enrolled into the chemistry Ph.D. program at UMD. 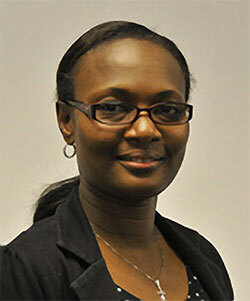 A leader in the Davis group, Yomi primarily focused on ion channels across membranes as her interest of study. At the University of Maryland, Yomiaccomplished many things including awards, attending conferences, and publishing. 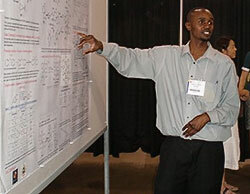 Yomi attended the 2008 NIH Graduate Student Research Festival where she participated in a poster presentation. She was also a recipient of the Mabel Spencer Fellowship for the 2008-2009 school year. Yomi has also given back to the community and inspires undergraduates and grad students alike through her participation in NOBCChE. Yomi is a former Vice-president of NOBCChE and was kind enough to be the special speaker at the October 2008 general body meeting. Her message gave her background as well as advice for undergraduates and graduate students in the chemistry department. She advised students to take particular care in choosing a research advisor, to set reasonably high goals, and to make their degrees their main focus. By taking her advice it is highly probable that our future scientists can become as successful on their journeys as Yomi has on her own. Williamson Oolo is a PhD Chemistry graduate of the Chemistry & Biochemistry Department. He came to the United States in 2001 in order to begin his undergraduate studies. Williamson received his bachelors degree in chemistry from Saint John’s University in Collegeville, MN in 2005. He pursued PhD level research on ligand-enabled functionalization of C-H bonds using palladium acetate, with dioxygen or hydrogen peroxide as the terminal oxidant, under Dr. Andrei Vedernikov. Williamson won the 2008 American Chemical Society travel award in the area of inorganic chemistry, won the NOBCChE Southeast Regional Meeting graduate presentation award in 2009, and has presented his research at multiple conference meetings. He was a dedicated member of NOBCChE at the University of Maryland since joining in 2007. © 2017 NOBCChE UMD Student Chapter - University of Maryland. All Rights Reserved.